On Saturday, Oct 16 at 6pm, Arts Gumbo presents The China Experience at the Rainier Valley Cultural Center featuring the Seattle Chinese Orchestra. The event includes an energetic performance of traditional and contemporary Chinese instrumental music, a Make Music With Us workshop and Chinese pasties and tea. 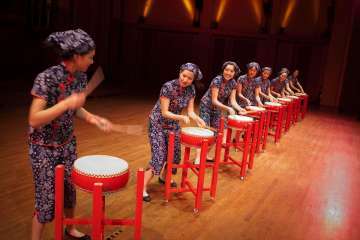 This event features The Seattle Chinese Orchestra (SCO) performing traditional Chinese music works by contemporary Chinese composers, as well as Classical music and music from other cultures rearranged for Chinese instruments. After the performance the audience is invited to a Make Music with Us workshop with the performers. Chinese pastries and tea will also be offered. SCO has over forty members performing on bow-stringed instruments, plucked instruments, woodwinds and percussion and is the only traditional Chinese orchestra in the Pacific Northwest. SCO's Music Director is Warren Chang and its current conductor is Roger Nelson. This event is co-sponsored by OCA – Seattle. For more information about the Chinese Arts and Music Association, visit www.uschinamusic.org. Arts Gumbo will take place at the Rainier Valley Cultural Center, 3515 S. Alaska St. (the SW Corner of Rainier Ave. & S. Alaska St.) in Seattle. Tickets are: $10 general admission, $7 for students and seniors, $5 for children ages 4-18, free for ages 3 and younger, and $25 for families of up to 4 people. Tickets are available at the door and online through Brown Paper Tickets. For more information about Arts Gumbo, call 760-4285, visit www.seedseattle.org or check out our blog at www.artsgumbo.com. Arts Gumbo is presented by SEEDArts, a program of SouthEast Effective Development. Arts Gumbo is supported in part by 4 Culture/King County Lodging Tax, Washington State Arts Commission, Seattle Office of Arts & Cultural Affairs, Muckleshoot Charitable Fund, The Lucky Seven Foundation, The Norcliffe Foundation, BNSF Foundation, The Tulalip Foundation, OCA – Seattle and SEEDArts Annual Fund contributors. For more information about SEEDArts, visit our website.